Elizabeth Warren would be more than a VP pick. She’d be a pander we can believe in. Sen. Elizabeth Warren addresses the crowd as Hillary Clinton looks on during a campaign rally in Cincinnati on Monday. For months the argument that Hillary Clinton should select Sen. Elizabeth Warren as her running mate struck me as the quadrennially annoying exercise in veepstakes overthinking and thus inadvisable for all the reasons Jamelle Bouie lists here. It would sequester Warren and her valuable insurrectionary skills into the office of a deputy. It would at least temporarily cost Democrats a Senate seat. Most importantly of all, as Jamelle writes, it would risk violating the first rule of vice-presidential selection: Do no harm. I’d iterate the rule even more abstractly: Don’t get cute with it. Install a comprehensively capable warm body with bureaucratic know-how in there and run the race from the top of the ticket, where it should and will be decided. But more and more I’m coming around to the idea that Warren solves a problem for Clinton that goes beyond mere signaling. The conundrum of Clinton on the hustings is that people hate her because she sounds like a panderer; she sounds like a panderer in part because that’s all an out-of-office candidate can ever be. Warren, given her policy portfolio, given that she already annoys all the people Clinton has only promised, glancingly and perhaps with a wink or two, to annoy, changes that dynamic right away. Picking her would effectively serve as Clinton’s first big governing decision. For example: Wall Street. For all of the talk Clinton made this primary season about imposing new regulations on the shadow banking sector, taxing both wealthy individuals and certain financial transactions, opposing the Trans-Pacific Partnership, and supporting various other populist policy planks, few people really … what’s the term … believe her. Left-of-center activists believe they’re being pandered to while financial elites believe that Clinton is pandering to left-of-center activists. For evidence of how lefties believe Clinton is just pandering to them: Sen. Bernie Sanders’ $200 million dollars in donations and 12 million primary votes this year. Sanders and progressives worried, with good reason, that Clinton would shed her commitment to more progressive policies once she successfully dispatched of Sanders. Though the Democratic platform drafting committee has voted to include several progressive planks, Clinton’s supporters on the committee curiously voted down an amendment making explicit the party’s opposition to the Trans-Pacific Partnership. Part of that was surely about avoiding an awkward stance against a sitting Democratic president’s signature trade agreement. But opposition to TPP is a position Clinton herself took during the primary. That looked like an explicitly political posture she would abandon later on, and the platform committee’s rejection of the amendment only fuels that speculation. Wall Street never really believed any of it in the first place. It sees Clinton—and Clinton sees it—as a partner at the table. The financial sector loves the Clintons. It loved President Bill Clinton and Sen. Hillary Clinton, and it believes the Hillary Clinton it loved before will be the one who governs after she’s gotten past all the election ballyhoo. In a piece from April 2015 titled “Clinton’s Wall Street Backers: We Get It,” Politico aptly summed up Wall Street’s view of Clinton’s populist-tinged inveighing against hedge fund managers and executive pay. “[T]he hedge fund managers who’ve long been part of her political and fundraising networks aren’t sweating the putdown and aren’t worrying about their take-home pay just yet,” Politico wrote. It’s “just politics,” said one major Democratic donor on Wall Street, explaining that some of Clinton’s Wall Street supporters doubt she would push hard for closing the carried-interest loophole as president, a policy she promoted when she last ran in 2008. Even if Clinton did release her platform drafters to give Sanders’ supporters whatever planks they wanted in the document, they would still be just that: planks in a party platform. Those are not without meaning, but they’re nonbinding commitments. She wouldn’t have to sacrifice anything tangible in acceding to them. Picking Warren would lay the groundwork for more aggressive policy moves by swapping a Wall Street fundraising base with a small-donor activist set. And lest anyone fear that Warren would be fully muzzled once she signed onto the team, the shift in fundraising bases would necessitate that Warren be kept as a key influencer within the administration. 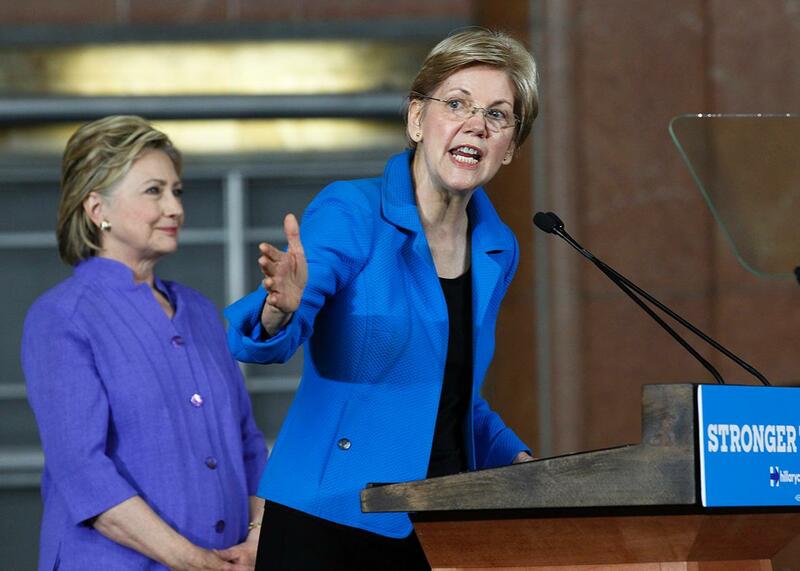 More broadly, selecting Warren allows Clinton to show, in a way that she hasn’t before, that she is not bought by elite interests at a time when elite interests aren’t faring so well politically throughout the West. It would show voters that she’s capable of taking it to Wall Street because she would be taking it to Wall Street, at a nonmetaphorical cost to her campaign. It would be action, not words, and it would show a side of Hillary Clinton that we can see on paper but aren’t sure exists in person.